Sergio El Darwich a pair of tying shots for Maine, but Central Connecticut hangs on. BANGOR — Tyler Kohl’s runner with 26 seconds left in the second overtime proved to be the game-winner as Central Connecticut survived tying 3-pointers by Maine’s Sergio El Darwich at the end of regulation and the first overtime to take a 93-90 victory on Saturday. El Darwich also had a 3-pointer to tie the game at 89-all with a minute left in the second overtime but he missed three free throws in the extra period, including 1 of 2 with 10 seconds remaining, which would have tied the game. Kohl finished with a career-high 33 points for the Blue Devils (6-6). El Darwich finished with four 3-pointers and 26 points, both career highs, for the Black Bears (2-11). (3) TENNESSEE 83, WAKE FOREST 64: Grant Williams had 22 points and 10 rebounds as the Volunteers (10-1) trounced the Demon Deacons (6-4) in Knoxville, Tennessee. (4) MICHIGAN 71, AIR FORCE 50: Iggy Brazdeikis scored 19 points and Charles Matthews added 17 to lead the Wolverines (12-0) to a victory over the Falcons (4-7) in Ann Arbor, Michigan. (5) VIRGINIA 72, WILLIAM & MARY 40: De’Andre Hunter scored 18 points, Kyle Guy had 16 and the Cavaliers (11-0) pulled away after halftime and beat the Tribe (4-8) in Charlottesville, Virginia. (7) AUBURN 93, MURRAY STATE 88: Samir Doughty scored 20 points, Austin Wiley had 17 points and 10 rebounds and the Tigers (10-2) held off the Racers (8-2) in Auburn, Alabama. 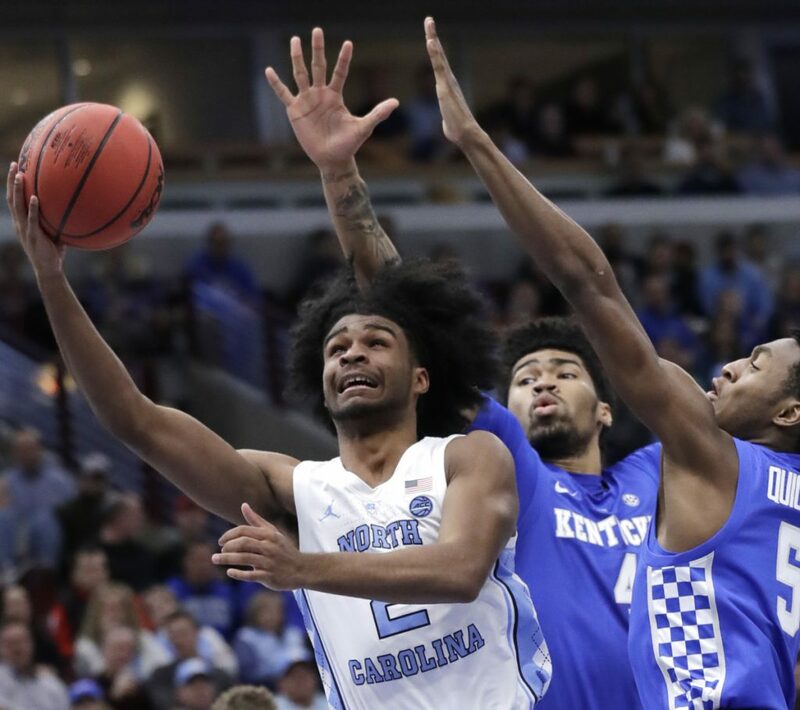 (19) KENTUCKY 80, (9) NORTH CAROLINA 72: Keldon Johnson scored 23 points, Reid Travis added 20, and the Wildcats (9-2) beat the Tar Heels in Chicago. (15) OHIO STATE 80, UCLA 66: C.J. Jackson scored 20 of his 22 points in the second half, and the Buckeyes (11-1) handed the Bruins (7-5) their third consecutive loss, in Chicago. (16) WISCONSIN 84, GRAMBLING STATE 53: Ethan Happ scored 19 points and grabbed his 1,000th career rebound, sending the Badgers (10-2) past the Tigers (6-7) in Madison, Wisconsin. (23) IOWA 110, SAVANNAH STATE 64: Joe Wieskamp scored a career-high 24 points, Jordan Bohannon had 18 on six 3s and the Hawkeyes (10-2) blew past the Tigers (3-11) for their fourth straight victory, in Iowa City, Iowa. (25) NEBRASKA 86, CAL STATE FULLERTON 62: James Palmer Jr. scored 23 points and the Cornhuskers (10-2) took control midway through the first half to defeat the Titans (3-9) in Lincoln, Nebraska. (1) UCONN 76, (14) CALIFORNIA 66: Katie Lou Samuelson had 20 points and 11 rebounds and the top-ranked Huskies (11-0) held off the Bears (9-1) in Berkeley, California. (2) NOTRE DAME 87, (19) MARQUETTE 63: Arike Ogunbowale scored 32 points and Brianna Turner added 20 to help the Irish (11-1) roll past the Golden Eagles (9-3) in Milwaukee. (13) MINNESOTA 91, RHODE ISLAND 71: Kenisha Bell had 28 points, nine assists, seven rebounds and two steals and the Gophers beat the Rams (5-6) in Minneapolis to complete nonconference play 11-0. ARMED FORCES BOWL: Army quarterback Kelvin Hopkins Jr. ran for 170 yards and an Armed Forces Bowl-record five touchdowns and the No. 22 Black Knights (11-2) overwhelmed Houston (8-5) 70-14 in Fort Worth, Texas, to reach 11 wins for the first time in program history. BIRMINGHAM BOWL: Jamie Newman ran for a 1-yard touchdown with 34 seconds left to cap a big performance and Wake Forest’s comeback in a 37-34 victory over Memphis in Birmingham, Alabama.